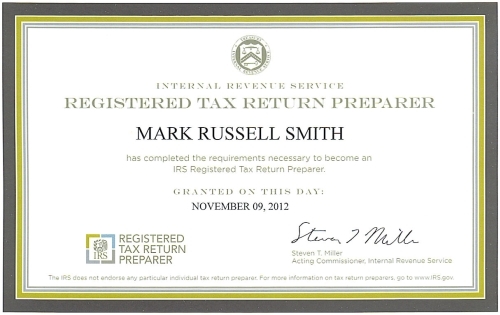 We are pleased to announce that Mark Smith, RTRP has passed the RTRP exam and has been designated as a registered tax return preparer by the Internal Revenue Service. The introduction of this requirement is part of the IRS’s ongoing efforts to ensure that taxpayers receive competent and professional service during the preparation of their tax returns. For more information on how to choose a tax preparer read our article “Tips For Finding A Paid Tax Preparer”. This entry was posted in Firm News and tagged Registered Tax Return Preparer, RTRP, Tax Preparer. Bookmark the permalink.